Boulder County has a long and colorful history of mining. 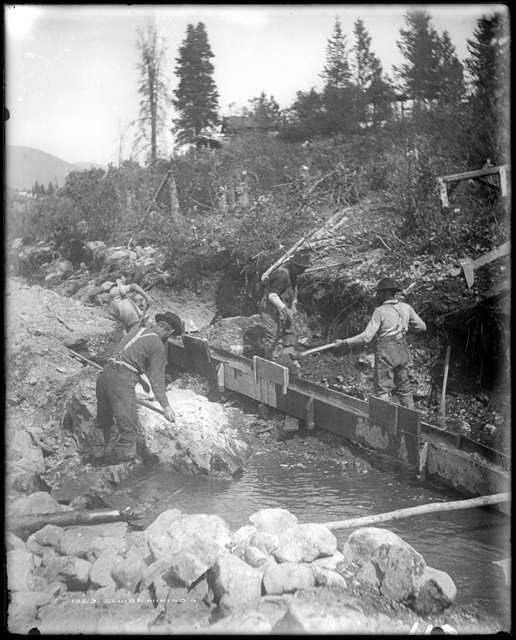 The first discovery of gold occurred in 1859 on Gold Run, about 12 miles west of Boulder. In 1869 the rich Caribou silver district was discovered west of Nederland. Rich discoveries of gold, silver, lead, and other metals also occurred at Ward, Jamestown, Magnolia, and other towns in the mountains. From about 1900 to 1918, Boulder County was the leading producer of tungsten in the United States. The tungsten boom ended when the mines in Boulder County could no longer compete with cheaper ores imported from overseas. Fluorspar was mined in the Jamestown district, up Lefthand Canyon northwest of Boulder. The ores described above are extracted from "hard rock" mines in the granitic and metamorphic rocks west of Boulder. Ore is further processed in milling operations to extract the beneficial materials. The Boulder County Health Department/Environmental Health has developed maps of historic hard rock mines and ore processing mills in the mountains of western of Boulder County. Much of eastern Boulder County is underlain by extensive beds of coal. The coal occurs in the Laramie Formation of Upper Cretaceous age. Mining began in 1859 near the town of Marshall, which is just south of Boulder. By 1920 over 1000 men were employed in scores of coal mines. Such towns in Boulder County as Erie, Marshall, Superior, Louisville, and Lafayette owe their origin to coal. Coal is no longer mined in the Boulder area. A map of historic coal mining activity in Boulder County has been developed by Boulder County Health Department. Boulder County has also been a minor producer of petroleum. The first producing well was drilled in 1902. The main field that was discovered is about six miles long and two miles wide, located just north of the City of Boulder on the Longmont Diagonal (Highway 119). Peak production in the county occurred in 1909, with the extraction of 86,000 barrels of oil. The oil comes from porous layers or fractures in the Pierre Shale of Cretaceous age. Building stone, especially the Lyons Sandstone, has been quarried locally in the past. Most Lyons Sandstone now comes from quarries near the small town of Lyons.